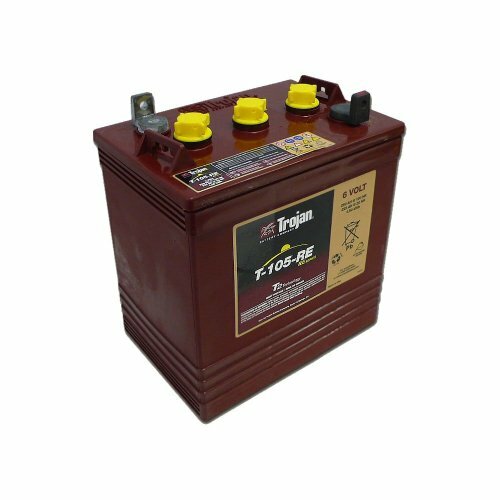 A deep cycle battery can supply power to run lights, fish finder, radios and other essential electrical elements even without 110 volt power supply. So it became most important source of power supply at any outdoor activity. 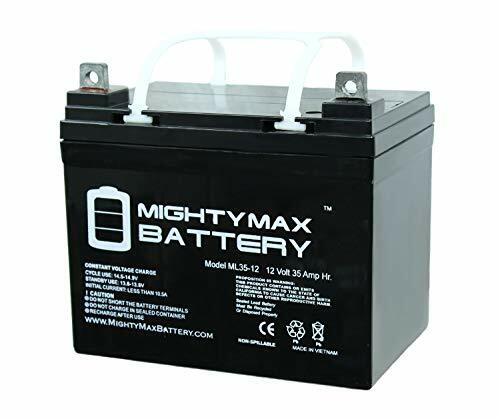 But when I had to buy a battery for a day long camping, the first question rise on my mind was- what features make a deep cycle battery good in quality? Should I look for capacity or voltage or ampere hour! Which one makes it better! After a long research, I was able to find the one I needed. And indeed, I am happy with that one. But I found many of you get confused like me selecting this. For selecting a reliable battery, I highly recommend picking the one which can give out a high amount of power within a few seconds. Still confused!? Don’t worry, I have summarized my experience to give you a proper idea about some great batteries and the way you can choose them. 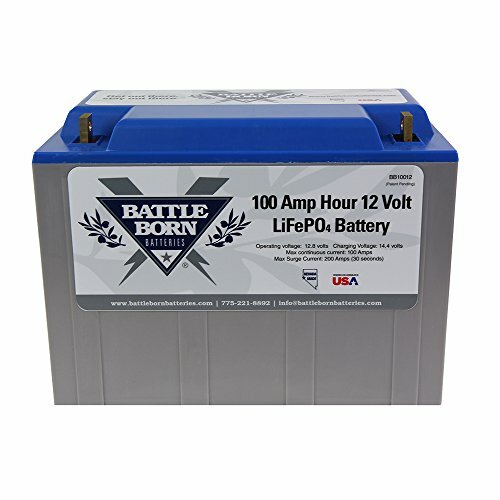 This is the best 100 AMP RV battery by the manufacturer named Battle Born Batteries. They are in the height of the technology of lithium ion. The 100 Ah 12 Volts LiFePO4 is one of the best RV batteries they’ve ever made. This battery can provide 100 AMP of continuous power output or 200 AMP surge output. 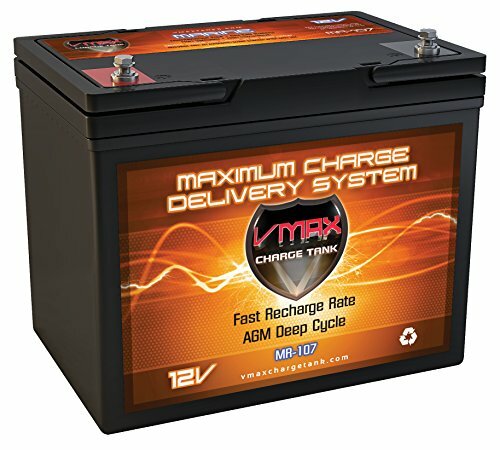 This is a 3000-5000 cycle battery and it accepts 14.4-14.6 charging volts. This is a sleek battery of only 29 lbs weight. The dimension of the battery is 12.75"x6.875"x9.0" so that this battery looks very compact. This battery is designed and assembled in USA and it has a free ground shipping qualifies. The battery is renewable as well. On the other hand, this is sustainable green energy battery. The battery is lees in weight, safer, non toxic and lasts for more cycle. This battery is design to last to 3000 cycles depth of discharge of up to 100%. In this point, the battery still holds 75-80% energy of its energy capacity. This battery is easy to use and maintenance free. This is also a modular battery. The BMS or built in Battery Management System protects the battery cells against low or high voltages. Basically, this is a best RV battery. Th﻿is﻿ battery is rated 35AH. It will power your RTV with for 20 hours while providing the equipment with a continuous supply of 1.75 amperes each hour. This battery is sealed. That gives you a peace of mind as you do not have to worry about spillages or hydrogen escaping during recharging. Hydrogen is an explosive gas released during lead acid battery charging. If it accumulates within an enclosed area, it may explode. This battery is marked HCPCS CODE E2365, which means it is cleared for air, road, and sea transport. It is the most reliable and safest RV battery. This battery is very compact in size. The dimension of the battery is 7.68x5.16x6.14 inches (LxWxH), so that the battery is lightweight too. The weight is only 23.1 lbs. this battery is able to serve continuous power supply. The DCM0035 is also a heavy duty battery as well. Additionally, this battery is maintenance free. This non lithium provides long life which is depended on power use by the application- lighting, agriculture, mobility or medical devices. This is sealed so that it can be mounted in any angle; this battery is suitable for air, ground or water surface/ transport. This battery has a Cold Cranking Ampere rating of 750A. It can supply 750 amperes for 30 seconds before the voltage drops below zero degrees Fahrenheit. It is rated: CA 870A, which means when operated at a temperature of 32 degrees Fahrenheit, it can supply a current of 870A, before the voltage drops below 7.2A. It is one of the best deep cycle rv battery for starting. This is a 12 volts battery with 43.5 pounds of weight. It has 5/16 stainless steel stud post, so this battery is able to serve you during bad weather. This battery offers you a Dual SAE. It can serve you with the reserve capacity for up to 12 minutes. Additionally, this battery can be fit in any kind of angel or position so you can use this everywhere. Also, this RV battery is 15X more resistant to vibration to durability. This kit is easy to use and it can be charged nicely. This battery is simply pretty good. This battery is mainly designed for dual purpose for both starting and deep cycle. The unique SpiralCell of the battery provides you a clean and strong power source. This battery is able to satisfy you. Able to serve even in bad water. This battery is rated at 85 AH. That indicates it can supply 4.25A every hour, for 20 hours without the battery being depleted of its charge. It has an RC rating of 160 minutes. This rating means the battery can supply 25 amperes at 80 degrees Fahrenheit for 160 minutes before the voltage gets below 10.5 volts. It has an HCA rating of 1380A. That means it can start your RV engine by supplying 1380A for 30 seconds at a temperature of 80 degrees Fahrenheit. The Marine Cranking Amperes means this battery can supply 700A for 30 seconds, at a temperature of 35 degrees Fahrenheit, before the voltage drops below 10.5 volts. This is a heavy duty Marine RV battery. This 12 volts battery is about 10.2x6.6x8.3 inches in length, width and height. 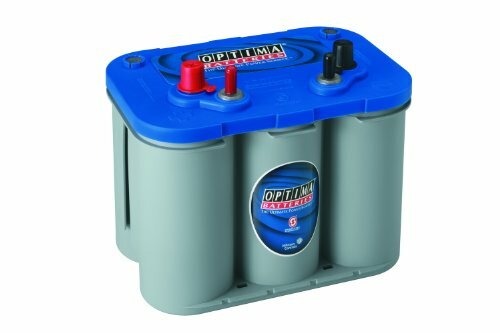 This battery has float service life span of up to 8-10 years. The Electrolyte Suspension System (ESS) VMAX tanks utilize the electrolyte suspension system by consisting the Absorbed Glass Matt (AGM) to a high porosity and it contains the electrolyte. This heavy duty battery has heavy duty grids and it offers you a maintenance free operation. This is simply a good RV battery. 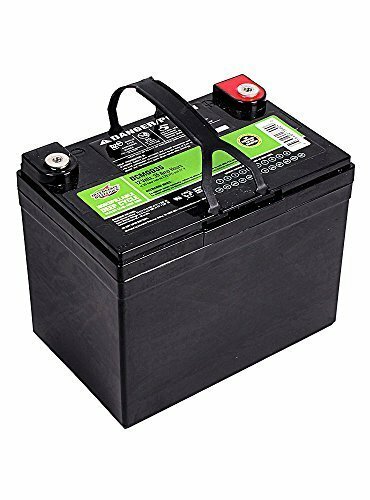 It is a lead acid battery that is sealed and will power your trolling motor or onboard RV electronics. It is rated 35AH. That means it can supply a current 1.75A for twenty hours before its voltage finally drops below 10.5 volts. It is made of AGM cell support structure. This Absorbed Glass Matt soaks the electrolyte and supports the cell plates. That makes this battery resistant to shocks and vibrations. This rechargeable battery is of 12 volts and this is suitable to be mounted in any position or angel. This is a SLA/AGM maintenance free battery and spill proof. The battery is able to resist shocks and vibration. The battery is very compact in size and lightweight (24 pounds). The cells are specially designed to provide continuous power to your grid. You can use this battery for a long time. This battery is perfect for your application too. You will find this battery very user friendly. This battery is able to satisfy you. Can be mounted in any angel or position. This battery is rated 35AH. It can, therefore, power your RV for up to 20 hours while providing an average current of 1.75 amperes continuously. This battery is sealed. That makes it safe to use in poorly ventilated places. It is a lead acid battery. That assures you of many recharge cycles or what you will see as a long service. It has an operating violate of 12V. 12V is the voltage rating for most electronic equipment in your RV uses. That makes it one of the best RV batteries. This is a sealed lead acid rechargeable battery and is of 12 volts and this is suitable for any kind of task like security, garage door backup battery, flashlight, electric gates or fences, portable medical device, solar, emergency power supply etc. The battery is very compact in size and lightweight. The cells are specially designed to provide continuous power to your grid. You can use this battery for a long time. This battery is perfect for your application too. You will find this battery very user friendly. This battery is able to satisfy you with its great capability. 12 volts sealed lead acid battery. It is rated 225AH. That means this battery can supply a current of 11.25A continuously for 20 hours before it is depleted of its charge. This battery uses flooded lead acid cells. It gives a better performance regarding the number of full discharge and recharge cycles it can handle. It is a deep cycle battery. That means it can discharge as much as 20% of its total capacity before recharging without damaging its cells. It supplies a voltage of 6 Volts. It is the best RV battery for powering sensitive electronic equipment. This battery is able to serve you with continuous power supply. This is also a long lasting power battery. This battery is great for off grid power. The 6 batteries is of 6 volts and very compact in size. The dimension is 10.375x7.125x1.875 inches in LxWxH. The weight of the battery is 67 lbs in total. You can use this battery for a long time. This battery is perfect for your golf court or application too. This battery is able to satisfy you with its great capability and features. This battery offers you an exceptional value. This battery features Absorbed Glass Matt. This glass supports the cell plates and keeps them covered with the electrolyte for maximum performance. It also makes this battery spill-proof. It is rated 105AH. That means it can supply 5.25A continuously for 20 hours. It can discharge 25 amperes for 195 minutes. That is over three hours of heavy use. It has a cold cranking ampere rating of 600A. It can supply 600A for 30 seconds at zero degrees Fahrenheit. It has a cranking ampere rating of 750A. It can provide your RV starting the motor with 750 A for 30 seconds at a temperature of 35v degrees Fahrenheit. This is a maintenance free battery. This is group 31 AGM marine battery. This is a leak proof kit. Besides, this is non-hazardous shock & vibration resistant battery. Additionally, this battery is highly environment friendly. The battery has a lower discharge rate and no gassing during the charging. You never need to add water in this batter so it is very easy to use and maintain. Hope, you will find this battery very user friendly. It is rated 50AH. It can supply 2.5 amperes continuously for 20 hours. That is enough to power small electronics a whole night without the need to recharge. This is a sealed acid battery. That means no maintenance of the electrolyte is necessary, and it is in fact not permitted by the manufacturer. You can also safely use in enclosed spaces. In contains an Absorbed Glass Matt. That glass soaks up the electrolyte to cover the plates wholly. That increases its cell efficiency and boost battery performance. The AGM also makes this battery shock and vibration resistant. This battery is SLA/AGM rated and maintenance free. The battery is spill proof as well. Also, this rechargeable battery can be mounted in any position or angel. It also has protection feature against vibration and shock. The dimension of the product is 7.72x6.50x7.17 inches so this is simply compact in size. The weight of the battery is 30.20 lbs. This is a long lasting battery and you can use this battery for a long period. This battery is suitable for application too. This battery is able to satisfy you with its great capability and features. This battery is rated 235AH. That means it can supply your RV electronic equipment with 11.75A continuously for 20 hours. It can store 1.57 kWh, making it the best RV battery if you want to create a battery bank of three or four batteries. It is a flooded lead acid battery. That means it has a long life cycle. You have to top up the electrolyte with distilled water once in a while when it gets low. This battery is able to serve you with continuous power supply. Though it is a tiny battery, but this is also a long lasting power battery. The battery is very very compact in size. You can use this battery for a long period of time. This battery is perfect for your golf court or application too. This battery is able to satisfy you with its great capability and features. 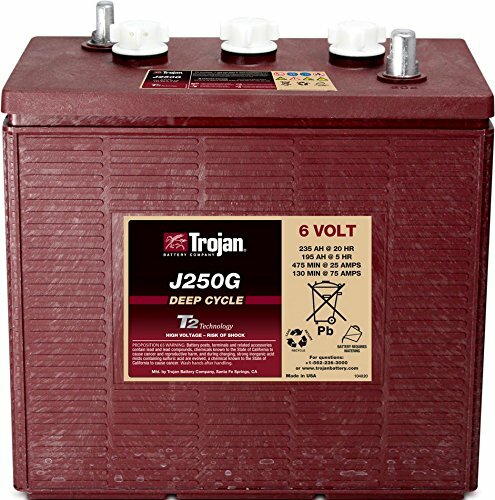 This battery offers you an exceptional value which is from Trojan. 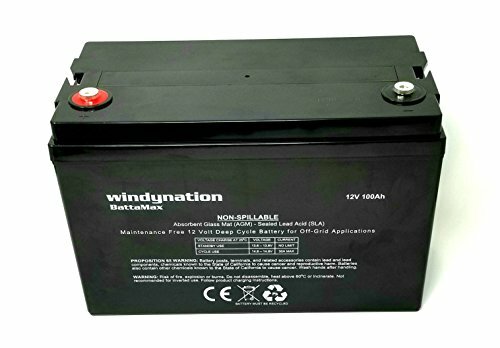 WindyNation 100 amp-hour, 12 Volt with heavy-duty plates are settled RV Battery. It is specially designed to give off-grid power. Maintenance free design ideal for the following applications: floor cleaning, inverters, material handling, golf carts, oil and gas, recreation (RVs, offshore marine, etc), and renewable energy, aerial work platforms, remote telecom. Maximum power storage (lower quality batteries often use recycled lead) and 99.995% pure virgin lead allows for an extremely low discharge rate. At 25 degrees Celsius float life is 10 to 12 years. The 10-hour rating is 100 Amp-Hours and the 20-hour rating is 110 Amp-Hours. Offers 1-year warranty. 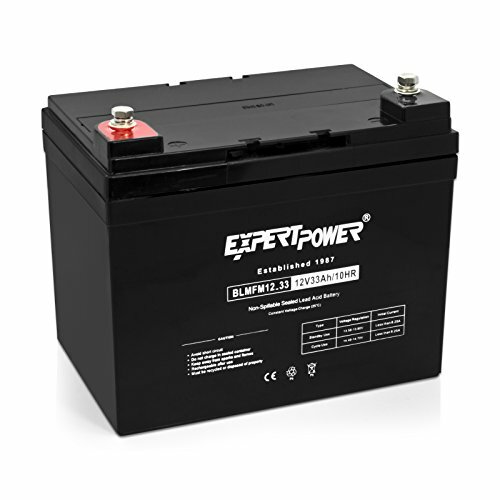 The highest quality materials available with made this ExpertPower Deep Cycle Rechargeable Batteries. The RV Battery case is made of a non-conductive ABS plastic for high-impact resistant. Shock, vibration, chemical, and heat have these components of strong resistance. 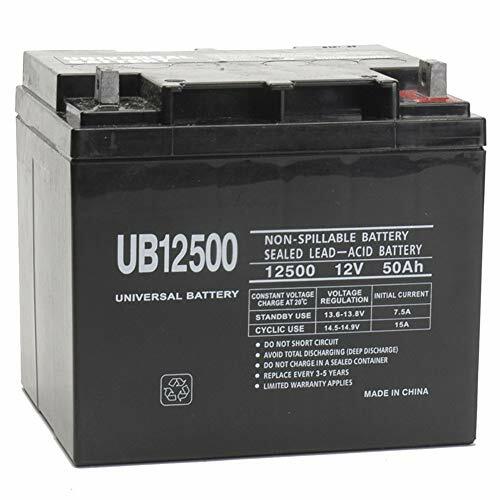 Lead Acid Battery is commonly used for: Solar Collectors, Electric Scooters, Lighting Equipment, Wheelchairs, Home Alarm Systems, Uninterruptible Power Supply(UPS), General Electronics, Home Security Systems, Emergency Systems, Medical Devices and many Other Applications. Acid is absorbed into the inside plate and thereby immobilized by a very fine fiberglass mat. With this valve controlled, the spill-proof build of batteries permits hard-free, safe operation in any location. It will ensure the safety of your home, your machine's movements or even a personalized HOBBY, available to use the most effective batteries. Shock, vibration, chemical, and heat have these components of strong resistance. Need to charge long time (6 to 8 hours) before run all application properly. Do these types of batteries contain enough power to start up a 250 horse Cummins diesel? No, they are not made as starting battery. They deliver power slowly and continuously and they provide it steady for long time. They are designed for it. If you try to use it as a starting battery, then it can be damaged. If you want starting battery, then you may find this helpful, our Jump Starter Lithium Ion Battery Review. How long are the batteries capable to power up a trolling motor like Minn Kota 30 lb with 2 average sized adults on board? Actually this depends on the Volts & AH. We can’t tell specifically but we can give you an example like a 12 Volts 35 AH can hold up a 40 lb Minn Kota on a 10.5 foot Porta Bote for a few hours. It also depends on the speeds. 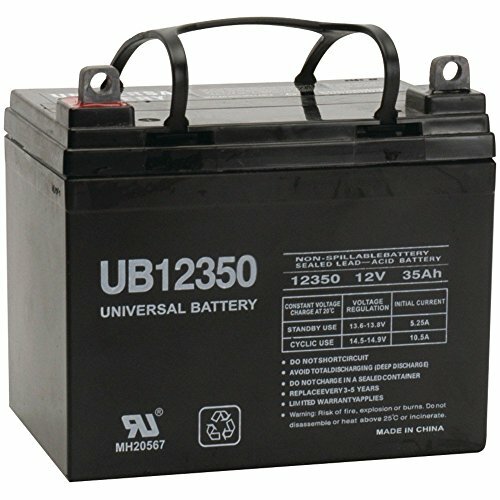 Are they universal battery? Do I need additional charger? The batteries are especially designed as marine battery. They are best in this section. But you also can use it for anything else. But for that, you need special charger. If you use the regular charger, then you will kill your battery. Should I completely discharge the battery the first few times? No, there is no need to do that. A RV deep cycle battery does not require any complete discharge at any time in its service life at all. But if you want, then you can do that. Do the cold and heat damage the battery? Usually No, but over heat or under cold can damaged your battery. Both of these conditions can reduce your battery life. For an example, we may tell that a fully charged battery at 80°F or 26°C should operate with 100% efficiency, at 32°F or 0°C, it turns with 65% efficiency and at 0°F or -17.8°C, it decreases with 40% efficiency. Charge your battery properly. Always keep the charge of your RV battery above 50%. If it goes below 50% anytime, charge it immediately. Do not overcharge your battery. Overcharging may reduce the lifespan of your battery. Charge as soon as possible after use. Do not charge your battery with over or under voltage. Always monitor the voltage the battery give out by using a digital voltmeter or the built-in monitor. It will help you to take proper steps to avoid damage. Check your battery on daily basis. It will help you to find out any sign of damage or leakage. Check the battery by a professional once a week to avoid any big trouble. Rinsing with water can help the battery to lessen the chance of overheating. Be careful while handling with battery. Always use safety gloves and eye protective glasses to avoid contact with fluids. Clean the out surface when it gets too much dirt. When choosing the rv battery, we look at the common needs of an RV. An RV will require continuous power for its onboard electronic equipment. It will also require a starting power when you want to move it or you are traveling. People are embracing renewable energy; you, therefore, have to know if the battery that can be recharged using solar power. Not every battery can recharge from solar panels were without wastage. The best deep cycle batteries also happen to be the best when using solar panels to recharge. But to also take care of the RV’s starting needs, we have to take into account its need for huge current draws for a short period. That is typically about 30 seconds. With that in mind, we can look at a battery’s features and match them with those of an RV’s power requirements. We, therefore, have to consider a battery’s Cold Cranking Amperes, Cranking Amperes, Reserve Capacity, and Ampere-Hour rating. Deep cycle rv battery should be able to supply your RV with both cranking power and power for running the RV’s appliances and lights. The cranking power of the battery varies at different temperatures. It is lowest at zero degrees Fahrenheit, and bets at about 80 degrees Fahrenheit. The reason behind that is that batteries perform better at higher temperatures than they do at lower temperatures. The higher the cranking rating, the better the battery will perform when starting your RV engine. 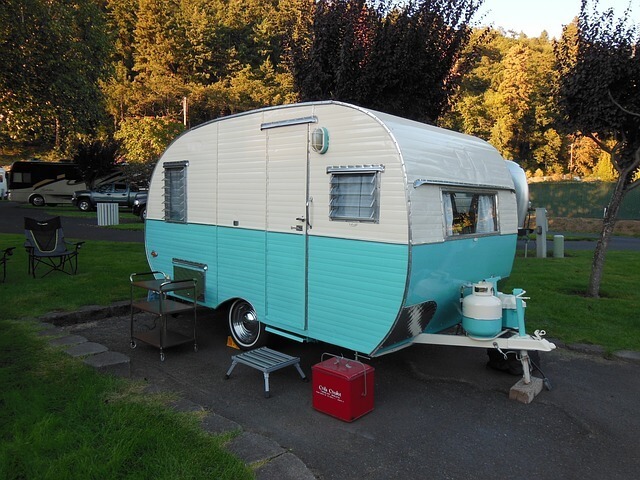 You won’t find yourself unable to start your RV when you need to the most. The power required to run the appliances depends on the reserve capacity of the battery and the ampere –hour ratings. The reserve capacity rating tells you how long the battery can power your equipment when supplying a constant current of 25 amperes. The best RV battery will have a higher rating. The ampere-hour rating tells you how much power the battery can give during a 20 hour period. The higher the rating, the better the RV battery will perform. You will not run out of power when you least expect to. You have to consider several features when buying a battery. These features are not limited to just an deep cycle rv battery; they also apply to other battery application as well. This is the amperes that the battery will supply when the starting motor is drawing power from it at a temperature of zero degrees Fahrenheit. 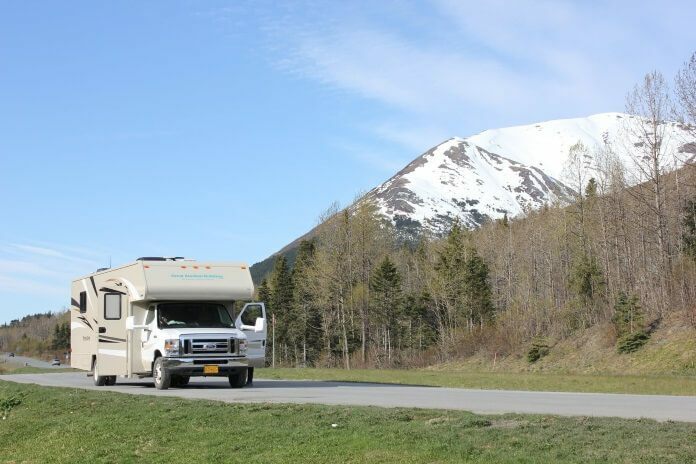 This rating is important if you will need to use your RV during winter. Battery performance gets degraded at lower temperatures. Therefore a higher CCA rating assures you the battery will su0ply enough power to start the engine during cold seasons. This is the power that the battery will supply when the battery is operating at temperatures of around 35 degrees Fahrenheit. This rating has the same importance as the CCA. It tells you how the battery will perform at temperatures above the freezing point of water. The better the CCA rating is, the better the RV battery’s starting performance. This is the amount of power that a battery will be able to deliver over a period of say 20 hours. The power is measured in the current supplied. So a battery rated at 240AH will be able to supply an average 12 amperes, continuously for 20 hours. This is the amount of power, which the battery can give for a specified period. It is measured in minutes. The common power output used is 25 amperes. So a battery rated RC 125, will supply 25 amperes for 125 minutes, then the voltage will drop below 10.5 volts. If a battery has an Absorbed Glass Matt construction, it means that it will be able to withstand vibrations and shocks well compared to a flooded lead acid battery. It can, therefore, supply the RV with power without a drop in performance even when you go off-road. A flooded battery cannot, however, do that without performance degradation. This is a sleek battery of only 29 lbs weight. The dimension of the battery is 12.75"x6.875"x9.0" so that this battery looks very compact. This battery is easy to use and maintenance free. This is also a modular battery. The BMS or built in Battery Management System protects the battery cells against low or high voltages. Basically, this is a best RV battery. The battery is renewable as well. On the other hand, this is sustainable green energy battery. The battery is lees in weight, safer, non toxic and lasts for more cycle. This is the best RV battery nowadays. This deep cycle rv battery has a Cold Cranking Ampere rating of 300A. That means it can supply 300A for 30 seconds at zero degrees Fahrenheit before the voltage drops below 7.2 volts. The Marine Cranking Ampere rating of 390A means it can supply a cranking current of390A before the voltage drops below 7.2 volts, at while operating at a temperature of 35 degrees Fahrenheit for 30 seconds. When you combine this impressive power features with its resistance to shocks, it makes this battery one of the best RV deep cycle batteries. It has a reserve capacity of 75 minutes. For its size and price, it makes it to our list of the best RV batteries. This battery is rated 35AH. It will power your RTV with for 20 hours while providing the equipment with a continuous supply of 1.75 amperes each hour. It has an Absorbed Glass Matt structure. That makes it resistant to shocks and vibrations. If you like running your truck engine to charge the battery, then this feature is important because that continuous vibration from the engine of a big truck might degrade as flooded acid battery. The AGM also makes this battery spill-proof. Therefore it also makes this marine battery our top three best RV batteries. This battery has a rating of 55Ah. This battery can supply your RV with 2.75 amperes each hour for 20 hours before its voltage drops below 10.5 volts. When you compare its price to this capability, it is a great deal. A supply of two amperes for 20 hours is enough to power most electronics onboard an RV. If the RV has electronics with more demanding power needs, having a battery bank made of two to four of these batteries will supply your RV with all the electrical power it can use. Therefore this battery also makes it to our top three best RV batteries. If you plan camping or traveling frequently, buying the best RV battery can be a great investment. You and your family or friends can have an amazing trip without any kind of interruption. Though choosing the best one is a little bit tricky, our guideline can help you to find out what suits your need. Don’t forget to consider ampere-hour and reverse capacity. Because these two have a huge impact on battery’s performance. After purchasing, your battery needs proper maintenance like- charging properly with a good charger, monitor the voltage, fluid maintenance, cleaning and so on. Because a good RV battery with proper caring can give you a great experience of the planned trip.